When you think coastal, modern farmhouse, meets boho chic...what comes to mind? Maybe nothing comes to mind because that’s just too much to process, or maybe you’re thinking, wow - disaster? Or maybe, just maybe, you’re intrigued. Our friends at Embellish Home decided to just go with it and wow was right - but in amazement! The lovely Hammer Homes house built at 8668 Drakes Boulevard was furnished and decorated by Embellish Home and displayed in the 2018 Parade of Homes for the viewing pleasure of so many! This fabulous house is currently on the market and could be the perfect home for you and your family. Hank Wilson with Crye-Leike Executive Realty can show you the rest of this home and more. Schedule a showing with him today. The design in the home was created for a young fun family with children, to be comfortable, cozy and to really be lived in. To begin the design, Embellish realized the family room was the main living area of the house and needed a lot of comfortable seating. The large sectional was chosen with custom performance fabric, tossed with several textured and muted color pillows for added comfort. The living room decor added in coastal colors of greens and blues with the beach glass lamps and an updated bohemian rug. The elements and details were chosen to be light and airy, calming and relaxing. The room is finished off with a large reclaimed wood coffee table and clock, and a large upscale painting of a barn. “What works in one home may not work in another. 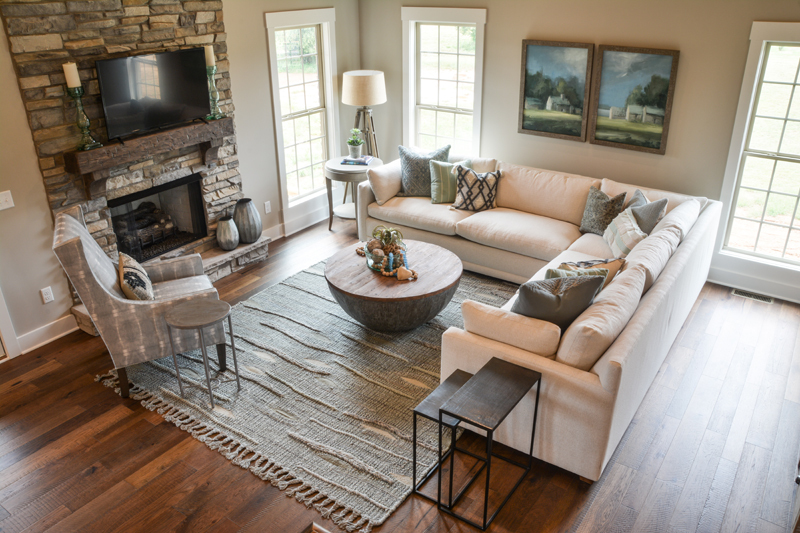 This home needed a sectional in the living room; it needed the comfort and space for a family to gather, but that doesn’t mean it will move to another home,” said Embellish owner Lisa Marshall. The living room and kitchen completely open up to each other in this layout so it was important to keep the design elements flowing throughout. The kitchen bar stools made of wicker continued the coastal vibe with a few choice accessories and nook bench for added seating. With the dining room right off of the kitchen, it was intended to be functional and casual, for everyday meals, not just formal dining. The round table chosen makes for easy conversation, and with the dramatic dark grey walls and wainscoting as the focal point, the furnishings remained simple with big artwork and more beach glass colors in the rug to tie it all together. “I just love this house. I could move into it tomorrow and feel at home. It was designed for comfortable living - all the square footage was maximized. It turned out so well,” said Embellish Manager Natalie Dew. Dew’s favorite room in the home is the office which she described as a relaxing work space, while Marshall’s favorite space in the house is the master bedroom, for its serenity and comfort. The master bedroom design was planned around a must-have hand knotted rug. It is one of the more traditional pieces in the home and can last for generations, with the ability to changing colors schemes and design styles around it. Even with all of the beauty inside the home, when you step onto the patio, it’s as if you’re in another indoor room, where you feel life taking place and are comfortable to be there. The furniture chosen looks and feels as if you’re in the living room, yet it is weatherproof, non-fading, and mold resistant, perfect for a family to enjoy a beautiful day. The end result of this mixed variation of design styles was breathtaking. Maybe not everyone could have pulled this off, but the ladies at Embellish impressed Parade viewers. Lisa and Natalie have different backgrounds and love that they really complement each other and can incorporate their different ideas together. One thing they both agree on however, is customer service is why they are in business. “When you go into someone’s home it is a compliment - they are inviting you to become a part of their life. You want to be welcomed back in and have people feel comfortable with you. We love the boutique feel and we never want to lose that,” said Marshall. Embellish Home works with clients on the use of their home or room, how they would like it to function, who they are, and what is important to them. From there they can assist with furniture and home decor planning and when needed offer full design services through Jo Design Company. Their showroom at 901 Lehman Avenue has a large assortment of furniture and home decor as well as highlights from many local vendors including wood signs and boxes from Revelation Culture, custom wood items from KY Bourbon Barrels and Wilson Wood, handmade jewelry from the Jolly Emporium, and metal work from Hobby Robby. Lisa and Natalie would welcome the opportunity to meet you, learn what you like and help you understand how to put it all together. Visit Embellish Home on Facebook or Instagram @embellishhomebgky.